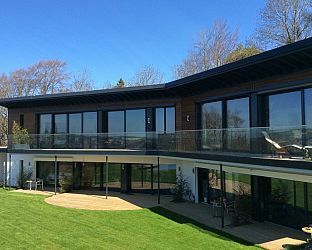 Luxury B&B in a 'grand designs' eco home with fabulous views over Lewes and the South Downs. Spacious, stylish en-suite rooms, superking beds, smart TVs, free wifi, guest lounge and terrace, healthy breakfasts, peaceful garden. Wheelchair accessible, dog-friendly. Close to Glyndebourne and Lewes Golf Course. Easy access to South Downs Way. Skyhouse Sussex is a healthy home designed with well-being in mind. By building a zero carbon home, we have joined the wider community effort to care for our beautiful environment. You can enjoy an extraordinary level of comfort when you stay at Skyhouse, thanks to the use of natural, sustainable building materials. We encourage guests to consider arriving by public transport, bike or on foot and offer a 10% discount on first night room rates to guests who leave the car at home. Visit Seaford East Sussex and the surrounding villages and stay in bed & breakfast, hotel or holiday home accommodation provided by BedPosts members. Seaford in East Sussex, population 23,000, is on England's south coast close to Newhaven, Brighton and Eastbourne. It is a seaside resort town and also a dormitory of Eastbourne and Brighton. For visitors the main attraction in Seaford is the beach. If you seek accommodation near Seaford in East Sussex you have come to the website of a “club” of providers who offer affordable quality accommodation around UK in hotels, bed and breakfasts, guesthouses, inns, and restaurants plus self-catering cottages and apartments .